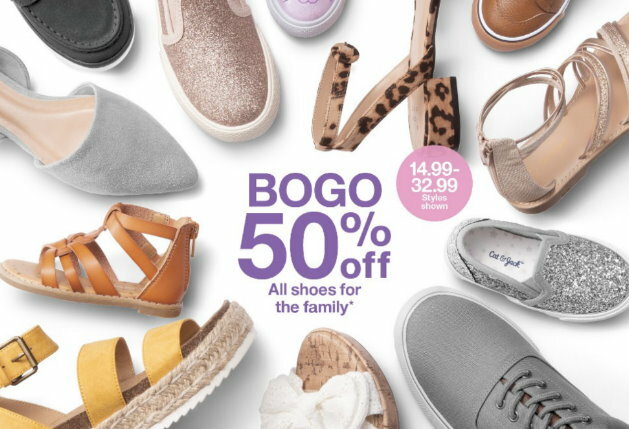 Thru Saturday, April 20th, Target.com is offering a nice B1G1 50% off All Shoes for the entire family both in stores and online at Target.com. Choose from lots of different styles and colors including sandals, sneakers, flip-flops, rain boots and more. There are also some super cute shoes for kids & babies. No code or cartwheel is needed, just keep in mind the lower-priced item will be the one that is discounted 50% Off at the registers or at Checkout. Shipping is FREE on orders of $35 or more, or choose FREE store pickup where available. And as always, if you have a REDcard you will get FREE shipping with no minimum and an additional 5% Off.